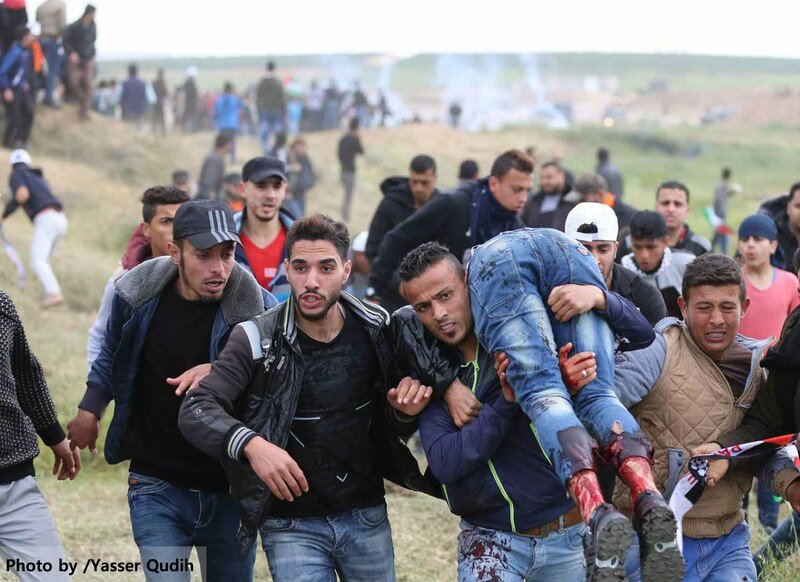 Al Mezan Center for Human Rights condemns in the strongest terms the unlawful lethal force used by Israeli forces against Palestinians, including unarmed protestors participating in Land Day demonstrations, and two farmers, on Friday, 30 March 2018. In two separate incidents, Israeli forces opened fire at Palestinians in Gaza near the border area. The circumstances were unclear and are still being verified by Al Mezan at the time of publication. Al Mezan’s documentation in the field shows that Israeli forces used live ammunition and artillery, killing 15 Palestinians and injuring at least 1,087 others, including 207 children, 35 women, and a journalist. Health sources reported that 40 of those injured are considered to be in critical condition. 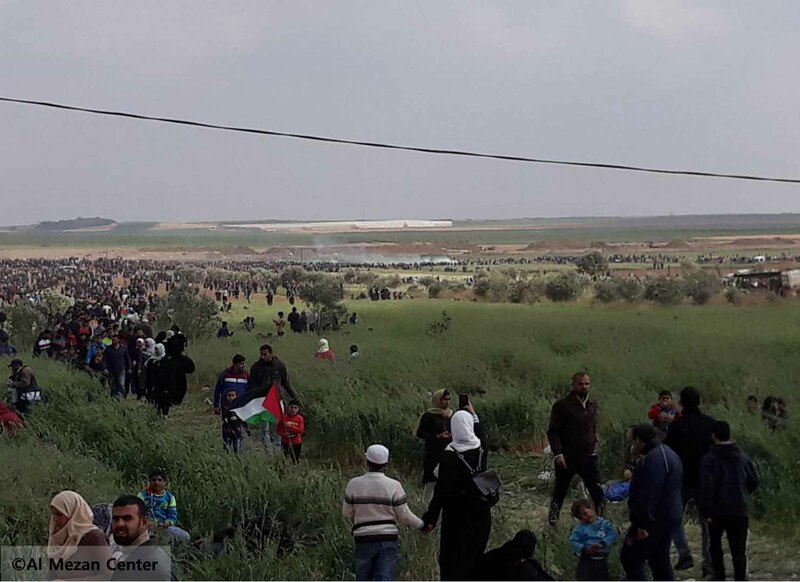 To mark Land Day tens of thousands of Palestinians joined demonstrations held on Friday, 30 March 2018, near the separation fence on the eastern borders of the Gaza Strip. 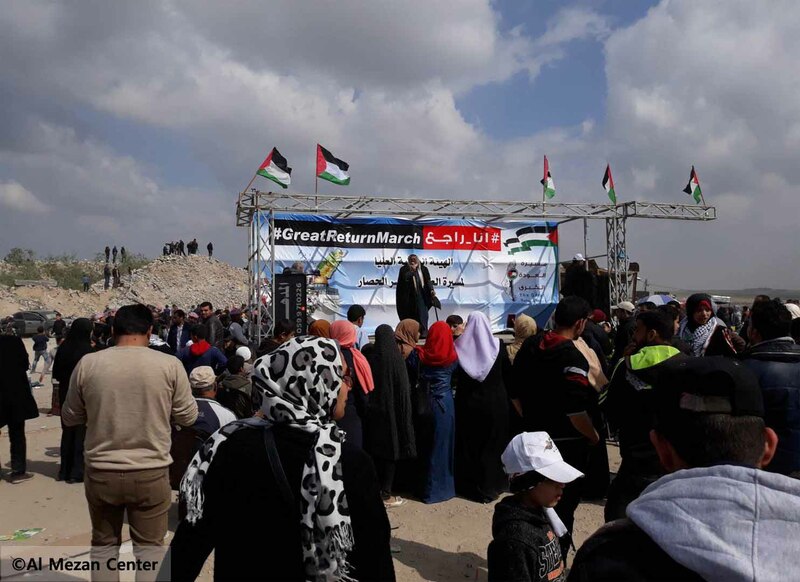 A series of protests called ‘The Great Return March’ have been called for by a national committee of Palestinian factions to affirm Palestinians’ right to return. Al Mezan’s documentation shows that Israeli forces used live ammunition, rubber-coated metal bullets, and tear gas against the demonstrators. The Israeli military had announced that troops and 100 sharpshooters were deployed to the border. In the southern Gaza Strip district of Rafah, Israeli forces shot Amin Moamar in the head, a 22-year-old protester, and Ibrahim Salah Abu Sha’ar in the neck, a 20-year-old protestor. Both young men were Rafah residents. The forces injured 126 protesters in the same governorate, including 23 children and five women. In the governorate of Khan Younis, Amr Abu Sammour, 26, was killed by an artillery shell fired at around 5am. Sammour was working on his farm, about 700 meters away from the border in Abasan Al Jadida town in east Khan Younis district, at the time of the attack. A nearby farmer was injured in the shelling. In the afternoon, Israeli forces located on the eastern border of Khan Younis opened fire at and killed Jihad Salman Abu Jamous. During the day, 220 protestors were injured in the district, including 31 children, 11 women, and a journalist. In the district of Deir Al Balah in the middle of the Gaza Strip, Israeli forces shot and killed Abdul-Qader Al Hawajreh, 42, and Naji Abu Hjayyer, 24; both were shot in the abdomen. The Israeli forces’ fire injured 164 more protestors, including 29 children and a woman. In the district of Gaza City, four persons were killed in shooting incidents by the Israeli forces: Mohammed Abu Amro, 35, was shot in the abdomen; Mahmoud Sa’di Ruhmi, 34, was shot in the chest; Ahmed Ibrahim Ouda, 19, was shot in the head; and Jihad Fareena, 35, was shot in the face. The four killed were residents of Gaza City. The Israeli forces injured 336 more protesters, including 70 children and 11 women in the district. In the governorate of North Gaza, Israeli forces killed five Palestinians: Mohammed Al Najjar, 25, was shot in the abdomen; Abdul-Fattah Abdelnabi, 19, was shot in the head; Bader Al Sabbag, 21, was shot in the head; Sari Abu Ouda, 27, was killed by artillery shelling, and Hamdan Abu Amsha, 23, was killed by artillery shelling from the northeast of Beit Hanoun city. The latter two persons were killed in an incident that is still being verified by Al Mezan. Through the use of live fire, Israeli forces injured 244 protestors, including 54 children and seven women. In response to the Israeli authorities preventing Palestinian search and rescue teams from retrieving two Palestinian protestors, whose conditions were unknown, from within the buffer zone in Gaza, Al Mezan and partner Adalah – Legal Center for Arab Minority Rights sent an urgent letter to Israeli authorities demanding they be given immediate access. Al Mezan condemns the Israeli forces’ practice of using live fire to police demonstrations and enforce movement restrictions inside the Gaza Strip. The protests occurred within a clear law enforcement context. The international human rights law framework requires that force is used proportionately, and lethal force is used only as a last resort in meeting an imminent threat of death or serious injury. Using lethal force against protestors who did not pose an imminent threat to life is a serious violation of the fundamental right to life. Al Mezan also recalls that international humanitarian law prohibits the targeting of civilians and deliberate attacks that lack necessity and that are conducted disproportionately. Al Mezan acknowledges UN Secretary-General Antonio Guterres’ call for an independent and transparent investigation and reflects on the years of impunity for serious international law violations that is the result of Israel’s judicial system. In the interests of justice and while urging independent and impartial investigations, Al Mezan calls for the international community to mitigate Israel’s inability and unwillingness to conduct effective investigations domestically. The international community must call on Israel to act in compliance with international law, including ensuring proportionate responses and strictly refraining from targeting civilians through procedures that are counter to international law principles. Crucially, the international community must take steps to remove the framework in which Palestinians are continually denied their basic, inalienable and fundamental human rights, including the right to self-determination.